Usually, a few questions arise in cat owners – do all cats require flea preventives or they are only important for outdoor pets. Is vaccination important or can a cat survive out of this? There is always a debate or discussion going on this statement. Veterinarians have different opinions, whereas the research studies bring in a varied picture and the reality faced by pet owners bring forth a way unusual scenario culminating into a vague confusion. To help pet parents especially cat owners to know the facts, when it is related to cat vaccinations, our survey team has discovered some hidden facts. Fleas can easily transmit from one pet to another. Flea-infested cats can easily spread diseases and fleas have a wider capacity to move from one place to another easily. Though fleas can be detected and removed, they can be easily transferred and make their way into the houses, Therefore, indeed indoor cats are at risk of flea infestations, though do not come in contact with other animals. To avoid such risks, it is necessary that cats should be treated with monthly flea preventatives. Fleas are quite insidious and it’s not uncommon for cat owners to always play a safe side by treating your cat with flea and tick treatments and restricting flea infestations. Heartworm disease is easily spread by mosquitoes, which easily finds a way to enter your indoor arena. Though outdoor cats are more likely to get infected, indoor cats are no exceptions with many cat owners bringing their cats to vet office for treatments. And, the best alternative to keep away the heartworm infestation is to provide monthly heartworm treatment to both indoor as well as outdoor cats. 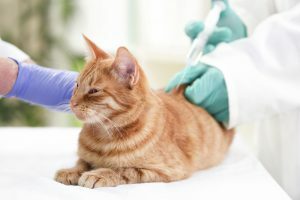 It is a common scenario that pet owners tend to miss vaccinations for their cats, thinking that their kitty does not require any unnecessary vaccinations. But, the reality brings forth the different picture. In lack of kitten vaccination shots, your cat succumbs to unwanted conditions like feline panleukopenia, which is usually high in felines. It is always on the safe side to follow vet instructions that are related to feline vaccinations and give them the shots accordingly. So, what is the concern of every cat owner. It is quite difficult to evaluate the right thing on treating your pet with preventives or not, whether to vaccinate or not. There have been different theories and evaluations onto these things. However, the best is to act according to your cat’s safety and your environment. Have a good talk with your vet and check regularly how important it is to treat your pet with monthly heartworm, flea, and tick treatments or give them vaccination shots.